A new Minotaur launch vehicle derived from retired missile parts successfully blasted off from the California coast Thursday, but officials lost contact with a hypersonic glider testbed for a U.S. military quick-response global strike system. The Minotaur 4 booster, flying in a downsized three-stage configuration, launched on a suborbital mission at 4 p.m. local time (7 p.m. EDT; 2300 GMT) from Space Launch Complex 8 at Vandenberg Air Force Base, Calif. The three-stage version of the launcher uses retired Peacekeeper missile motors. The configuration is called the Minotaur 4 Lite. A small winged glider designed by Pentagon researchers was the payload for Thursday's launch. The craft, called the Hypersonic Test Vehicle 2a, apparently did not complete all of its planned maneuvers to demonstrate new hypersonic flight systems. "Preliminary review of technical data indicates the Minotaur Lite launch system successfully delivered the Falcon HTV 2 glide vehicle to the desired separation conditions," the Defense Advanced Research Projects Agency said in a statement. "The launch vehicle executed first of its kind energy management maneuvers, clamshell payload fairing release and HTV 2 deployment." Thursday's launch was a key milestone before the Air Force can begin flying a building backlog of delayed satellites. The Air Force and Orbital Sciences Corp. will add an Orion 38 fourth stage motor to the Minotaur for satellite launches beginning as early as July 8. The Minotaur 4 rocket is a more powerful model than the similar Minotaur 1 booster, which has launched military payloads eight times using decommissioned Minuteman missile components. The Minotaur 4 rocket can launch up to 3,800 pounds of payload to low Earth orbit, according to the Air Force. The $800 million Space Based Space Surveillance satellite will soon be shipped to Vandenberg for the July flight. Supported by Boeing Co. and Ball Aerospace & Technologies Corp., SBSS will detect objects in space with a sensitive optical telescope. The data will supplement Air Force ground-based radars already tracking the increasing traffic of satellites and debris in Earth orbit. 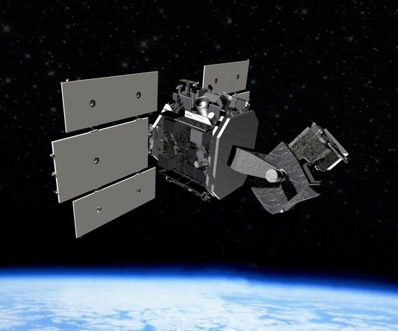 The optical sensor will not only track spacecraft in orbit, but it will provide unrivaled insight into the missions and purposes of countless foreign satellites, according to Air Force Col. James Jordan, vice commander of the Space Superiority Systems Wing and the SBSS mission director. SBSS was supposed to launch in October, but engineers discovered the gas generator device that powers the Minotaur 4's third stage steering system would produce unintended thrust after the motor burns out. A team of government and industry engineers spent several months designing a diffuser to reduce the unintended thrust within acceptable levels. "The team was ready to go when we discovered this third stage valve gas issue, which required a diffuser to be built," Jordan said. It had to be designed, developed, tested and validated." 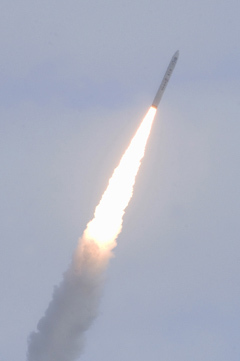 A Peacekeeper SR120 third stage motor outfitted with the new diffuser was successfully fired in a ground test March 31. The results were favorable, according to Jordan. The Air Force also added the diffuser to the Minotaur 4 Lite's third stage for Thursday's launch. The grounding of the Minotaur 4 rocket triggered a cascade of launch delays for military satellites. After SBSS launches in July, two Minotaur 4 flights are planned this fall from Kodiak Island, Alaska. The HTV 2a payload launched Thursday separated from the Minotaur high in the upper atmosphere at a velocity more than 20 times the speed of sound. But tracking assets lost contact with the triangle-shaped craft 9 minutes after liftoff. "An engineering team is reviewing available data to understand this event," DARPA said in a written statement. After its release from the Minotaur third stage, the craft was designed to try out its aerodynamic control system and conduct sweeping turns to bleed off excess energy and demonstrate its cross-range capabilities. The DARPA press release did not specify whether any of the test maneuvers were completed before controllers lost communications with the craft. The HTV 2a was supposed to glide over the Pacific Ocean at more than 13,000 mph and splash down in the sea near the U.S. Army's Reagan Test Site at Kwajalein Atoll. The HTV program is managed by DARPA, a Pentagon research and development division focusing on high-tech demonstrations. Officials say the HTV demonstrations were supposed to test enabling technologies that could eventually be employed by an operational system capable of prompt global response missions. The HTV was built by Lockheed Martin Corp.
A second test vehicle was scheduled for launch in early 2011 on a similar flight, according to a DARPA spokesperson. But that schedule was announced before Thursday's mishap. The tests are part of DARPA's Falcon project, which once included a follow-on vehicle called Blackswift, or HTV 3. Blackswift would have demonstrated reusable hypersonic flight technologies. Engineers planned for the craft to take off from a runway, cruise at Mach 6 on an air-breathing engine, and return to a landing strip. 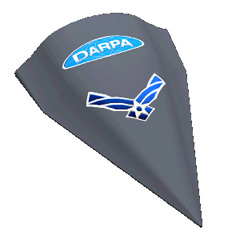 After Congress reduced the program's budget, DARPA announced Blackswift's cancellation in late 2008.